Saturday wasn't a night for making grand statements but Cormac Costello managed to pen a mini one all the same. Saturday in Croke Park was an evening when Costello again drew attention to his lavish scoring talent and afterwards, Jim Gavin expressed his admiration for the huddled, frozen supporters who by then, were thawing out somewhere warmer, plotting a route to Tralee next Saturday. "I'm full of admiration for all those Dubs who turned up tonight," said Gavin and given the Baltic conditions in which they stayed stationary for an hour and a half on Saturday evening, it wasn't hard to see his point. "We really appreciate it, and in the second half you could hear them getting behind the team. "At this time of the season we are just three weeks back today. "In some ways we are just getting into pre-season if you will, so to get two points on the board is important," he outlined. "We take each game in isolation, we were disappointed last week we didn't get anything out of it in terms of the scoreboard but in terms of the workout it was a really useful exercise. "We did very little this week so there was a bit of freshness in the legs today. "That first-half that we mentioned certainly won't be good enough in Tralee next week," he warned. In the absence of anything else to talk about last week, Dublin's defeat in Clones had attained oddly high levels of significance in the some of the scrutiny that followed. Everything they do this year will be micro-analysed and a second successive defeat on Saturday night would have been something out of the ordinary for this team, who have never lost back-to-back league matches under Gavin. With a trip to Tralee looming, the potential to be three loses from three games before the mini break in this year's competition seemed very plausible. At half-time on Saturday, Dublin were a point ahead (0-6 to 0-5) but neither team had done anything to suggest they were about to exert the sort of control Gavin's men had on the second. Chief among the effort was Costello. On Saturday night, he showed for everything from the pivot of the Dublin attack, running hard from the 'D' and habitually taking his man on. Costello's finishing was crisp too and a haul of 0-6, five from play, reflective of a productive evening's work. Last year's run of fitness saw Costello push hard for a starting summer spot although ultimately, he was confined to the role of highly-prolific substitute. A maintenance of Saturday night's form would make it impossible for Gavin to leave him out. "Certainly it benefits a player if he's getting a good run of games in the league to stake a claim to a championship spot," the Dublin manager acknowledged. "That's the form that we'd know from Cormac. First and foremost he's a great team player and does an awful lot of work off the ball for the team. "To see Cormac getting those scores today isn't a surprise." Gavin also gave full debuts to Seán Bugler, Liam Flatman and Ryan Basquel while Darren Gavin saw game-time from the bench and on the limited evidence of Saturday night, each warrants further inspection. The night was remarkably also for the fact that Dublin scored two points from offensive marks despite the fact that they aren't currently using the experimental rule in training. "No, didn't practice it at all, or talk about it either," Gavin confirmed. If Costello provided the finishing touches on Saturday, Brian Fenton and Jonny Cooper brought the intelligent leadership. 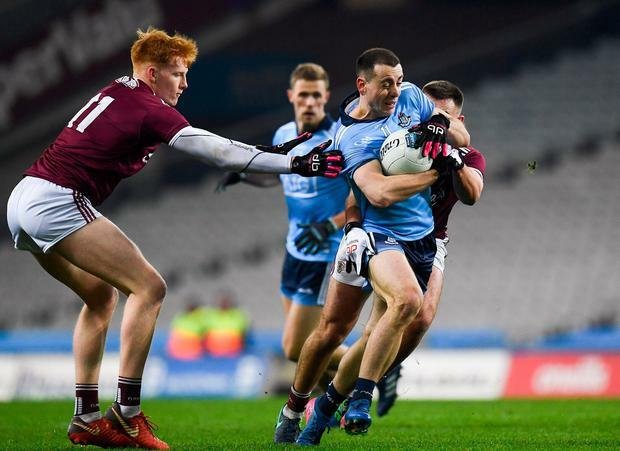 Dublin had already started to stretch away and Costello was well into his groove by the time Dean Rock scored the only goal of the night in the 57th minute. "It's our first competition of the season, we want to do well in it and we can only do well by getting the performances in games," Gavin reasoned. "That's what we looked for tonight and in patches we got it." GALWAY: M Breathnach; E Kerin, S Kelly, SA Ó Ceallaigh; G O'Donnell, G Bradshaw, J Heaney; K Duggan, T Flynn; C McDaid, J Duane, P Cooke; P Cunningham, C D'Arcy, S Walsh. Subs: B McHugh for McDaid (ht), G Armstrong for Cooke (63), D Wynne for Ó Ceallaigh (66). WIDES - Dublin: 9 (5 + 4). Galway: 5 (2 + 3). BOOKED - Dublin: 1 (Flynn 65). MAN OF THE MATCH: Cormac Costello (Dublin).